Expanding on Sonic Reality's latest "Sounds for Film" and other media category, Cinema Sessions offers unique sonic effects with a musical twist! Whether it is orchestral hits and swells or the exotic ambience of ancient Aztecs to use in film, music or any media production, Cinema Sessions is the ideal source for any music composer, DJ or media producer. Cinema Sessions includes the following four Cinema Sessions collections. 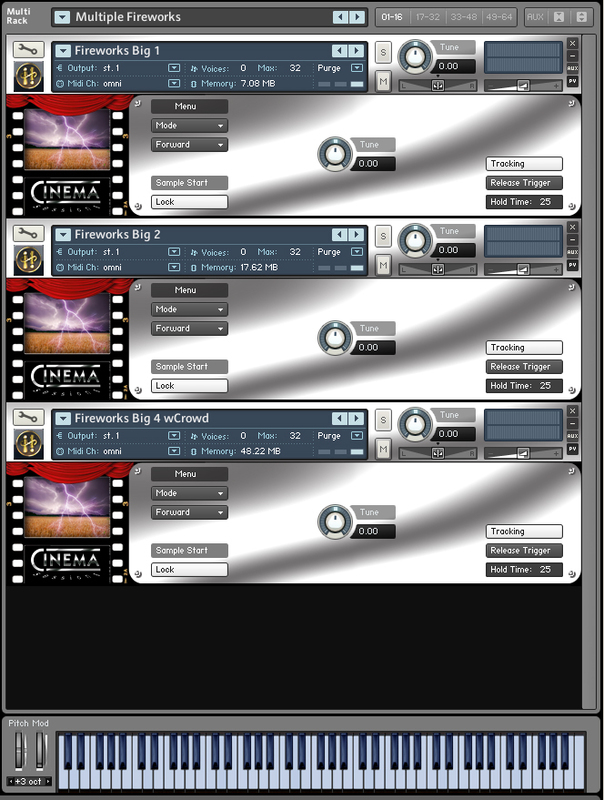 Symphonic Effects contains over 400 orchestral effects for film, tv, games and popular music styles. From sci-fi/suspense/horror hits, drones and intertwining melodies to emotional build-ups this collection offers a wide assortment of hard to find symphonic effects you can use to create the ultimate sound track. Special features include instant forward and reverse playback, time stretch, built-in effects and quick layering capabilities for building an infinite amount of complex new textures. Symphonic Effects offers world-class film score quality effects to use in any style of music or multimedia production royalty free. Global Atmospheres contains over 1350 samples of exotic sounds from all over the world. From tribal Native American drums to Ancient Aztec Ambiance to rare sounds from the Mediterranean, this collection is a must-have for any media producer, sound designer or music composer. Whether you are creating authentic world sound effects for films and video games or wanting to add ethnic sonic flavors to electronic, rock, pop and world music, it delivers a diverse range of rare sonic landscapes, percussion loops, authentic voices and ethnic instrument riffs. Ambient Atmospheres features a combination of film texture pads, drones and ambient soundscapes with ambient sound effects from Sonic Reality. With the type of sound effects you d hear in films and video games to effects used in a musical context such as classic rock albums or ambient electronica, Ambient Atmospheres has a wide range of Thunder Storms, European Train Announcers, Airports, Oceanic Soundscapes, Close Range Fireworks, Birdsong, Dog Barks and futuristic "other world" sound design. Special features include instantforward and reverse playback, time stretch, built-in effects and quick layering capabilities for building an infinite amount of powerful ambient soundscapes. Dimensional Effects features over 100 outstanding special effects for music and multimedia production. Featuring special, cutting edge warped electronica or avant-garde soundscapes, Dimensional Effects adds instant twisted sound design to any production. * Over 2,000 effects patches of textures, ambiences, dimensional grooves, drones, whooshes, and more! 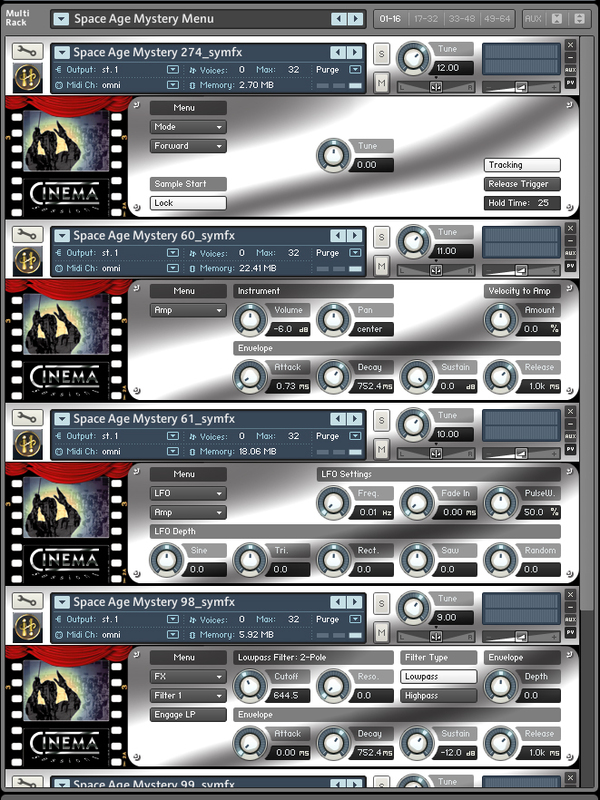 * High-quality sounds encoded for Sonic Reality's Infinite Player, making Cinema Sessions part of an easily and infinitely expandable library! 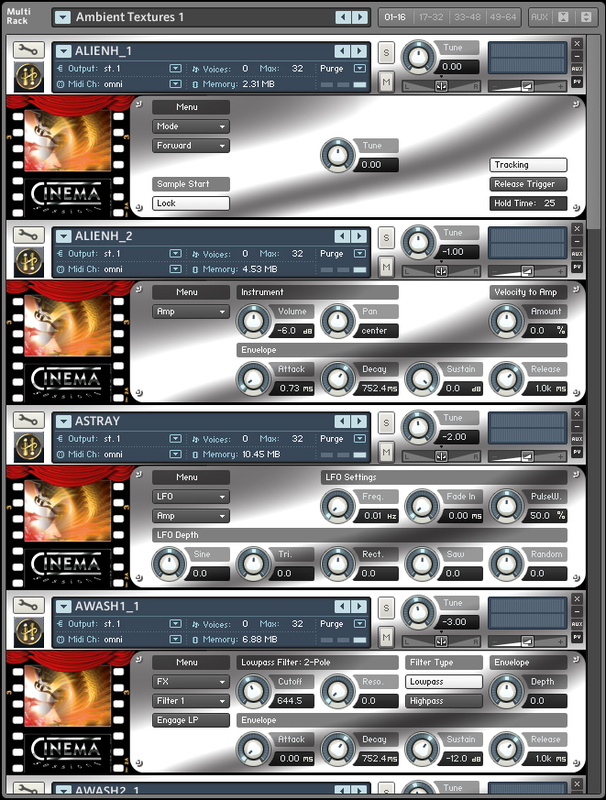 Cinema Sessions is a powerful virtual instrument and sound library with sounds that can be used in any style of composition for Film, TV, Video Games, Radio and any genre of music that calls for special effects. The concept behind this powerful series is to provide scoring effects that can be called up and instantly molded like clay into an infinite range of possible sounds designed and performed in real time. Powerful scoring effects can be used to make world-class soundtracks faster than ever before. Whether you need a powerful workstation of every type of effect on hand or you want to use the fast and easy on board manipulation features, built-in DSP effects and layering to create unique sounds where people will wonder how you did it, Cinema Sessions is a must-have for any media producer, music composer or sound designer. Here are more details about the product. Each sound in Cinema Sessions can instantly be called up and manipulated in many ways. There are four different modes of playback. The default mode is to play the sound forward (“forward” mode) but you can also play any sound backwards simply by selecting the “reverse” mode. If you want to turn any effect into an unpredictable exciting harmonic synthesizer then you can choose “formant” mode and for experimenting with the engine’s convenient time stretch capabilities there is the final “Time Stretch” mode for fitting a sound into a scene or doing creative grain-style synthesis. 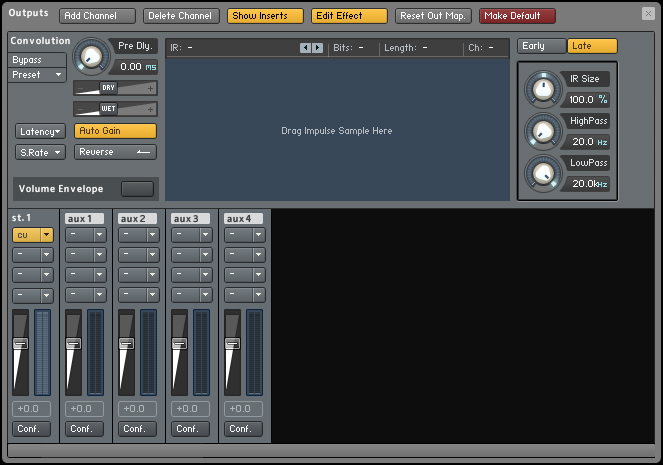 In this page there is also a “Sample Start” which is controlled by a midi keyboard’s modwheel (or midi CC knob). With this you can instantly dive into any point in the duration of the sound and then by hitting the “lock” button on (white) it makes that the new start point of the sound for that patch! You can also choose to have the pitch tracking on or off and even set the sound to trigger upon release of the midi note for advanced interactive performance effects. This page offers a variety of control over the amplitude of the sound from simple volume and pan to an ADSR sound shaping envelope to velocity/dynamic response from a midi controller. The LFO PageBringing in fun experimental synth features such as LFO modulators is a welcome addition for any sound designer. A variety of different waveforms and parameters can modulate Amplitude, Panning, Pitch or Filter. In the Auxiliary Sends and Output Mixer Inserts there are even more DSP effects on hand including a powerful Convolution Reverb which allows you to drag and drop an impulse response from a scene or field recording and match the ambience between the effect and the dialog or other sounds in the scene. All of these features can be tweaked easily by any user and saved back with infinite variations without losing the original factory settings. Sounds can be layered together as “Multis” or they can be individual “Instruments” with unique sonic qualities that can make someone wonder how you got THAT sound. This is why the entire Sounds for Film category for the Infinite Player is a treasure chest of creative sources for any producer or composer. MAC: Mac OS 10.2.6, G5 1.2 GHz - Universal Binary Intel Mac Compatible , 2 GB RAM, DVD Drive, *An activated Sonic Reality Infinite Player + Kontakt Player or Full version 3.5 of higher is required to play these sounds. [Note: Kontakt Player 4 may also be used but is not compatible with PPC Mac]. This product will also work with Kontakt and Kontakt Player 5. Please see www.native-instruments.com for system requirements.